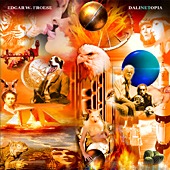 Edgar W. Froese's original COVER ARTWORK is released on high class pure cotton canvas. Every artwork comes with a STAMP of AUTHENTICITY. ATTENTION: Unfortunately due to Edgar's sad passing in January 2015 the original artwork will be signed by his wife Bianca Froese-Acquaye.